Carotid.net General Public Area . : Diagnosis : Carotid artery examination :. 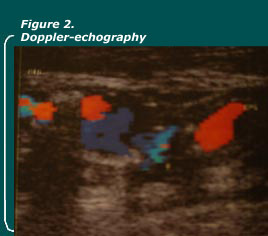 This painless examination is done by placing a probe on the patient's neck and analyzing the speed [of the blood flow] in the carotid artery by ultrasound and the structure of the plaque by echography (figure 1). 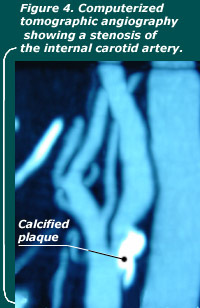 One may thus obtain an evaluation of the extent of the stenosis and of the structure of the plaque (figure 2). This examination is performed by injecting an iodine contrast medium into the arterial circulation and taking and processing X-ray films of the carotid artery. The films show the inner part of the artery. This makes it possible to measure the stenosis (narrowing) of the carotid artery. You should inform your attending physician or the physician who will perform the examination if you are affected by renal failure or if during a prior therapy or examination you were told that you were allergic to iodine. 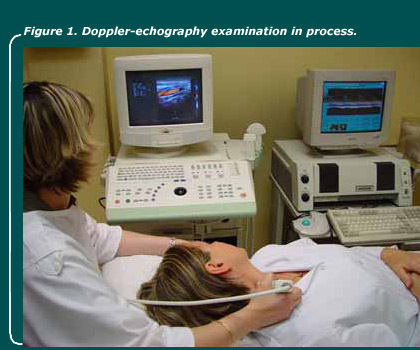 This examination depends on cervical scanography. The carotid artery is reconstituted from scanner cross sectional views. This examination requires the injection of an iodine contrast medium. As for the digitized subtraction angiography, you should inform your attending physician or the physician who will perform the examination if you are affected by renal failure or if during a prior therapy or examination you were told that you were allergic to iodine. 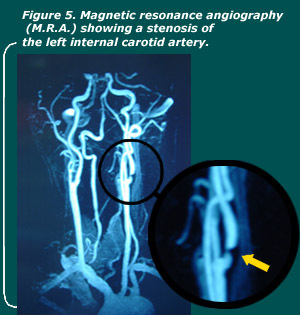 This angiography is derived from a cervical M.R.I. The carotid artery is reconstituted from cross sectional views obtained through M.R.I. the first examination usually performed is a Doppler echography and, depending on the results from this Doppler exam, an M.R.A., a radioisotope angiography or a conventional angiography may also be performed.